Custom Jiggers - A Great Promotional Gift For Your Brand! Custom Jiggers – A Great Promotional Gift For Your Brand! When you go to a bar, have you ever wondered how the bartender stylishly prepare your drinks with such immaculate accuracy? They actually do this using custom jiggers, which is a bartender’s measuring device. A jigger usually has 2 different sides, the bigger side, called the jigger or gill, . The smaller side meanwhile, called the pony, can be filled with 1 oz (30ml) of liquid (the usual amount of a normal shot glass). Made out of stainless steel, these jiggers are portable and durable, making it perfect for mixing cocktails. 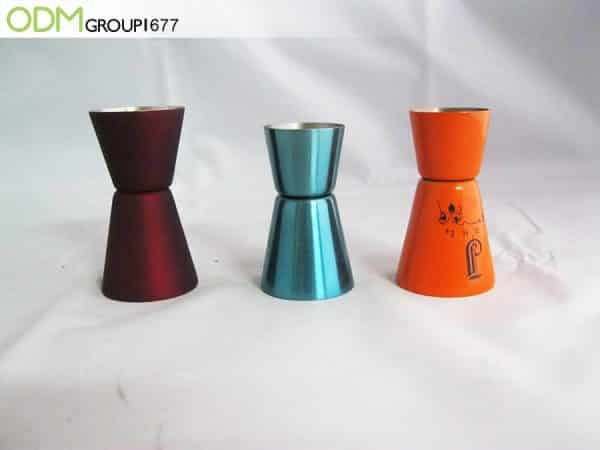 Aside from the fact that bartenders can perform aesthetically pleasing tricks with the jiggers, there are also various reasons why your company would benefit from having some promotional custom jiggers to help market your goods. Why should you consider these custom jiggers for your next promotion? Branding Opportunity: With these promotional custom jiggers, there are plenty of space on the side for branding. Therefore, you will be able to prominently brand your company on the jiggers. This would help to increase brand awareness of your company as your customers, and whoever they share it with, uses it. Design: These jiggers act as a great promotional tool due to its design. The design gives off a luxurious and modern feel, which will impress customers. Furthermore the sleek design and slick metal finish, will be sure to match perfectly with any alcoholic bottles. Practical Use: The custom jiggers are a great promotional tool, as they have a practical use. For instance, a potential customer could use the jiggers to mix their own cocktails. This would make it popular among customers, as they would have a use for it. Used in parties, they could help spark conversation about your brand. How can you use these Custom Jiggers to promote your company? There are many ways that the jiggers can be used to promote your company. For instance, the jiggers can be used along with on pack bottle neckers. The jiggers can be taped or attached to the bottle as a promotional bottle necker promo idea. Or marketing managers could set up a bottle collar promotions. They can put the instruction on how to redeem custom jiggers at inner part of the bottle necker. 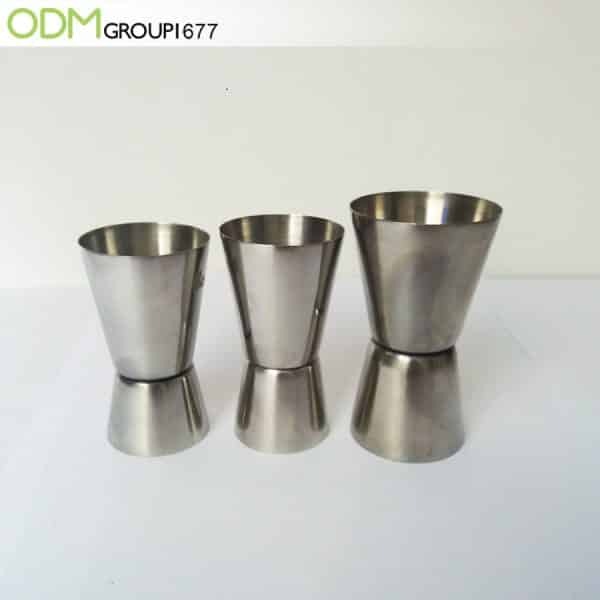 Another way that the custom jiggers can be used would be in a drinks gift set, together with other bar items such as shot glass, shakers, and ice buckets, among others, for a bar promotional idea. High-end custom packaging design can also be used for the gift set. This branded gift set by Jim Beam is an excellent example. The bourbon brand put together a practical gift pack that includes a custom drinking cup, a branded promotional pourer, and a jigger. When used for parties, at home or at work, these items gain the brand the recognition it deserves. Would your company benefit from having these promotional jiggers? If so, feel free to send in an inquiry for product code 677. Here at The ODM Group, we specialize in unique promotional products, as well as creating custom retail packaging and POS display units. So, you can be sure that your company will be safe in our hands for any project! Here’s some cool packaging ideas for alcoholic drinks! Some marketing products for the alcohol industry! A gift set would be good to spice things up! Spice Up Your Drink with Johnnie Walker’s Alcohol Gift Set!